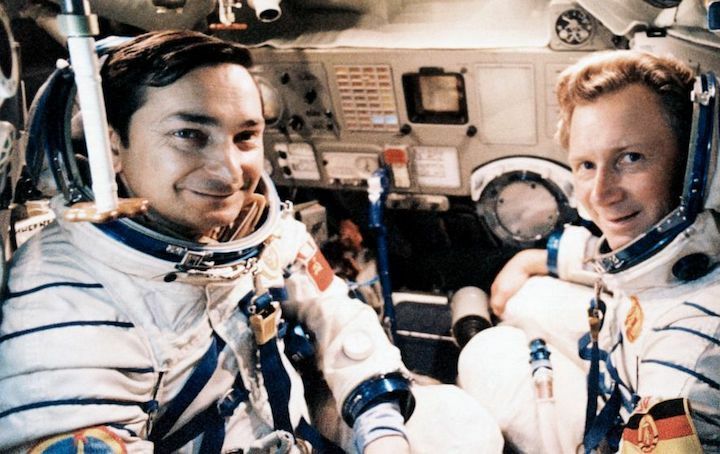 In this file photo dated August 26, 1978, Soviet cosmonaut Valery Bykovsky, left, poses with first German astronaut from East Germany Sigmund Jaehn, at the Cosmodrome in Baikonur, prior to their space trip aboard Soviet rocket Soyuz 31 to the Salyut 6 space station. Russia's space agency said Wednesday March 27, 2019, that pioneering Soviet-era cosmonaut Valery Bykovsky, who made the first of his three flights to space in 1963, has died at age 84. Russia's space agency says pioneering Soviet-era cosmonaut Valery Bykovsky, who made the first of his three flights to space in 1963, has died at age 84. Roscosmos said Bykovsky died Wednesday, but it didn't state a cause of death. Bykovsky was one of 20 Soviet military pilots in the first group picked to prepare for space. He first flew to space in June 1963 as a member of the Vostok-5 crew. 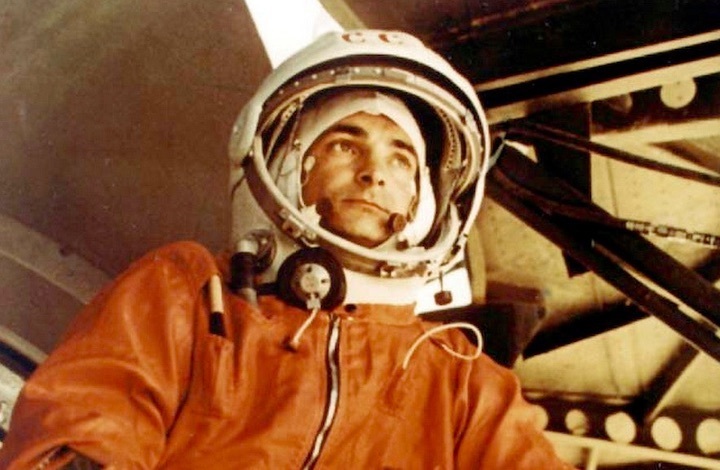 He underwent training for a moon mission before the United States won the race to the moon and the Soviet Union canceled its plans to go there. Bykovsky made his second space flight in 1976 and his third in 1978. He spent nearly 21 days in orbit in all. Soviet-era cosmonaut Valery Bykovsky, whose first of three spaceflights was a joint mission with the world's first woman to fly into space, has died. He was 84. Bykovsky's death on Wednesday (March 27) was confirmed by Russia's federal space corporation Roscosmos. "Bykovsky belonged to the first generation of Soviet cosmonauts, who wrote many bright pages in the glorious history of Russian manned cosmonautics," officials at the Gagarin Cosmonaut Training Center in Star City said in a statement. Bykovsky was selected for the Soviet space program alongside Yuri Gagarin as a member of the first group of cosmonaut trainees in March 1960. He flew three times to space, logging a total of 20 days, 17 hours and 47 minutes in Earth orbit. Bykovsky launched on his first mission on June 14, 1963, as the pilot of Vostok 5, the former Soviet Union's fifth spaceflight and the 11th worldwide. Once in orbit, he radioed to the ground that he was "feeling fine." Bykovsky spent his time conducting basic science experiments, using a camera to film Earth's horizon and observing the growth of peas. He exercised and recorded his body's reaction to the microgravity environment. Two days into his flight, on his 31st orbit of Earth, Bykovsky was joined by another cosmonaut in space. "Have started carrying out joint spaceflight," radioed the pilot of Vostok 6. Valentina Tereshkova, the first woman in space, flew in tandem with Bykovsky, with their two spacecraft coming as close as 3.1 miles (5 kilometers) of each other. "Dependable radio communications established between our ships. Are at close distance from each other," they reported. Bykovsky had originally planned to be in space for eight days, but increased solar flare activity resulted in his Vostok 5 mission coming to an end after 4Â days, 23 hours and 7 minutes. The duration was long enough to set a new record for time in space and Bykovsky's retains the title for the longest solo spaceflight in history. His landing on June 19, 1963, three hours after Tereshkova, also marked the end of the Vostok program. Bykovsky's next mission came 13 years later, with his liftoff on Sept. 15, 1976 as commander of Soyuz 22, a refurbished spacecraft that had been a backup to the Apollo-Soyuz Test Project jointly flown with the United States the year prior. Flying with his Soyuz 22 crewmate Vladimir Aksyonov, Bykovsky spent a week observing Earth, taking more than 2,400 photos of the planet with a multi-spectral camera that could take six images simultaneously. The two captured photographs of Siberia, Central Asia and Kazakhstan, as well as the moon as it rose and set through Earth's atmosphere. Bykovsky's third and final spaceflight was an Interkosmos mission with Sigmund Jähn, Germany's first citizen in space. Bykovsky and Jähn lifted off on board the Soyuz 31 spacecraft on Aug. 26, 1978, on a week-long flight to deliver supplies to the Salyut 6 space station. 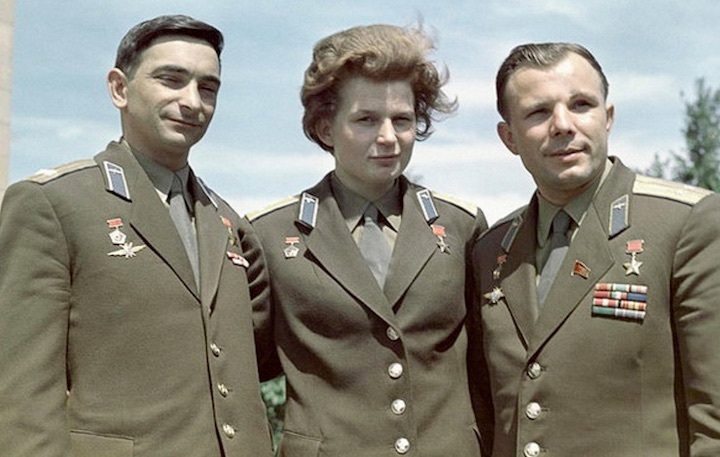 The two joined the orbiting outpost's two person crew to conduct experiments before returning to Earth on Soyuz 29, leaving their Soyuz 31 capsule behind to land with a later crew. Valery Fyodorovich Bykovsky was born on Aug. 2, 1934 in the town of Pavlovsky Posad, located about 40 miles (65 kilometers) east of Moscow. Initially interested in being a sailor from a young age, a talk at school attracted him to learn to fly and he joined the Moscow City Aviation Club. Bykovsky graduated from the Kachinsk Military Aviation Academy in 1955 and, after a year-long assignment to a jet fighter unit, began serving as chief pilot and a parachute instructor with the 23rd Interceptor Flight Regiment of the 17th Air Division in the Soviet Air Force. In 1959, prior to testing to become a cosmonaut, Bykovsky was promoted to promoted to senior lieutenant and achieved the rating of military pilot, 3rd Class. In addition to his three spaceflights, Bykovsky served as a backup to the Vostok 3 and Soyuz 37 missions. 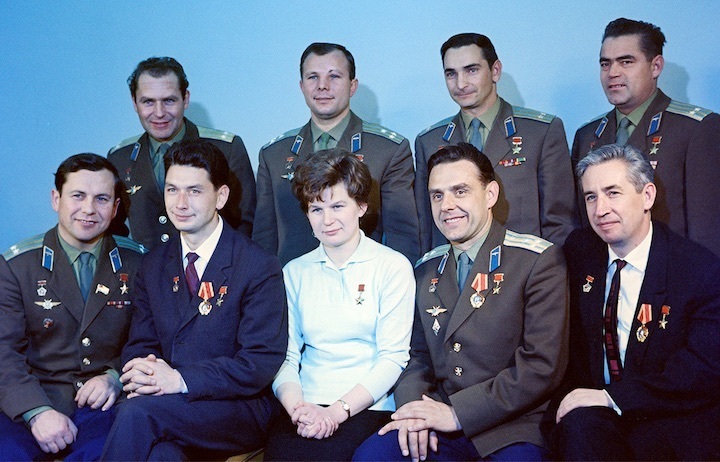 Between his first and second launches, Bykovsky was assigned to the prime crew of Soyuz 2, but that mission was canceled after Soyuz 1 ended in tragedy. He then trained for a circumlunar mission slated for March 1969, but that too was canceled as a result of technical problems and the success of NASA's Apollo 8 mission in December 1968. Following Soyuz 31 and his Soyuz 37 backup assignment, Bykovsky served as a cosmonaut trainer before leaving the space program in 1988 to serve as the director of the House of Soviet Sciences and Culture in Berlin. He retired in 1990 at the age of 56. For his service to his country's space program, Bykovsky was named a Hero of the Soviet Union and awarded the Order of Lenin and the Order of the Red Star, among numerous other Russian and international honors. Bykovsky was preceded in death by the pilots of the first four Vostok missions (Gagarin in 1968, Gherman Titov in 2000, Andriyan Nikolayev in 2004 and Pavel Popovich in 2009), who died in the same order they flew. Of the original group of 20 cosmonauts, only Alexei Leonov and Boris Volynov are still living. Bykovsky was married to Valentina Mikhailovna Sukhova, with whom he had two sons, Valery (who preceded Bykovsky in death in 1986) and Sergei. 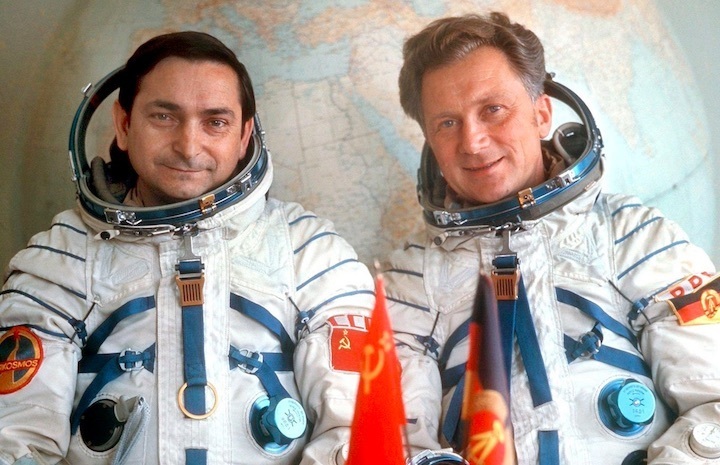 "The leadership of the Cosmonaut Training Center, pilot-cosmonauts of the USSR and Russia and the whole team offer their condolences to the families and friends of Valery Fyodorovich," the training center leadership said.